Sir:—I have just received from His Excellency, Henry A. 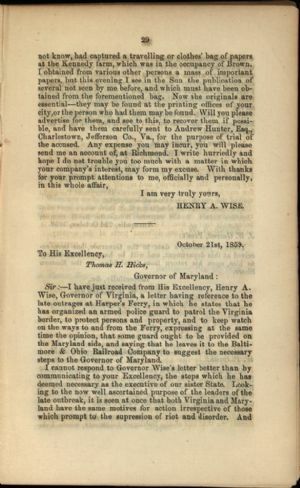 Wise, Governor of Virginia, a letter having reference to the late outrages at Harper's Ferry, in which he states that he has organized an armed police guard to patrol the Virginia border, to protect persons and property, and to keep watch on the ways to and from the Ferry, expressing at the same time the opinion, that some guard ought to be provided on the Maryland side, and saying that he leaves it to the Baltimore & Ohio Railroad Company to suggest the necessary steps to the Governor of Maryland. Maryland. General Assembly. Senate, 1860. Harpers Ferry (W. Va.), History; John Brown's Raid, 1859.